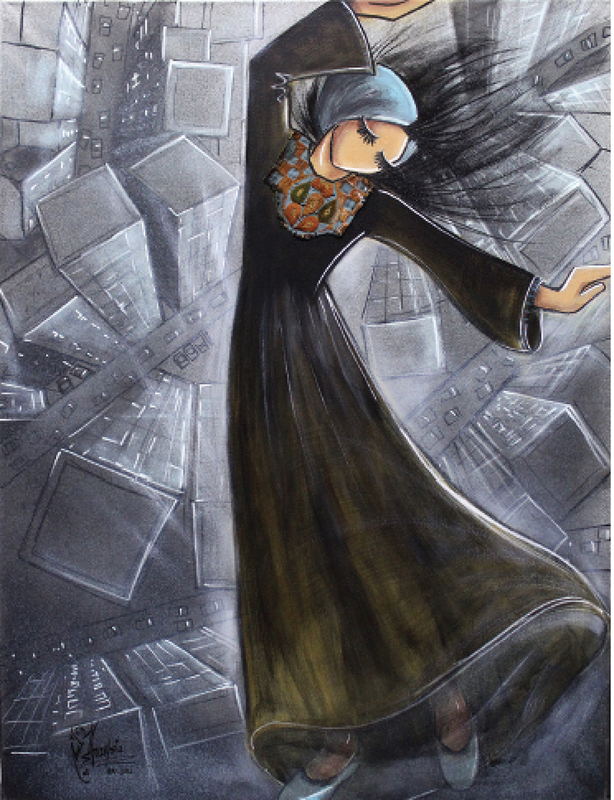 An exhibition of paintings and three dimensional works by graffiti artist Shamsia Hassani who despite the danger she faces is “re-spraying” Afghanistan’s cultural image. Forgoing the jargon of headlines news, this exhibit reintroduces the often over looked people, culture and artistic expression of Afghanistan. With this representation Roya Khadjavi and Maryam Seyhoun built a stage for the artist to exercise her freedom while signaling the underpinnings of a complex and terribly emotional period in Afghanistan’s history. Freedom unfolds in the realm of artistic play characterizing Hassani’s impulse as a contemporary artist to change the view of the devastation in Kabul by covering the bad memories of war one paint spray can at a time. Prestige is a colorful and lighthearted depiction of youth and hope. Hassani’s girl is active, strong, graceful and dynamic. Although sometimes lost in reflection, her energy and youth combined with a coy sweetness commands the viewer’s attention. She wants to show the world that she is a person, that she has worked hard to make it through all the atrocities, and weather she lives in her country of birth or has migrated to a foreign land she is committed to keep her pride, her dignity, and her identity.